Not every college course is an educational thrill ride packing the punch of a triple shot of espresso – there are plenty that are a better sleep aid than a dose of ZzzQuil. From prerequisites to major coursework, college students experience every emotion between love and hate when reflecting on the many credit hours they’ve completed. Which classes do college students favor the most? And are some subjects universally despised? We surveyed 500 current and former college students to understand the most loved and hated college courses. Keep reading to see if your favorite subjects are beloved or scorned across university campuses. 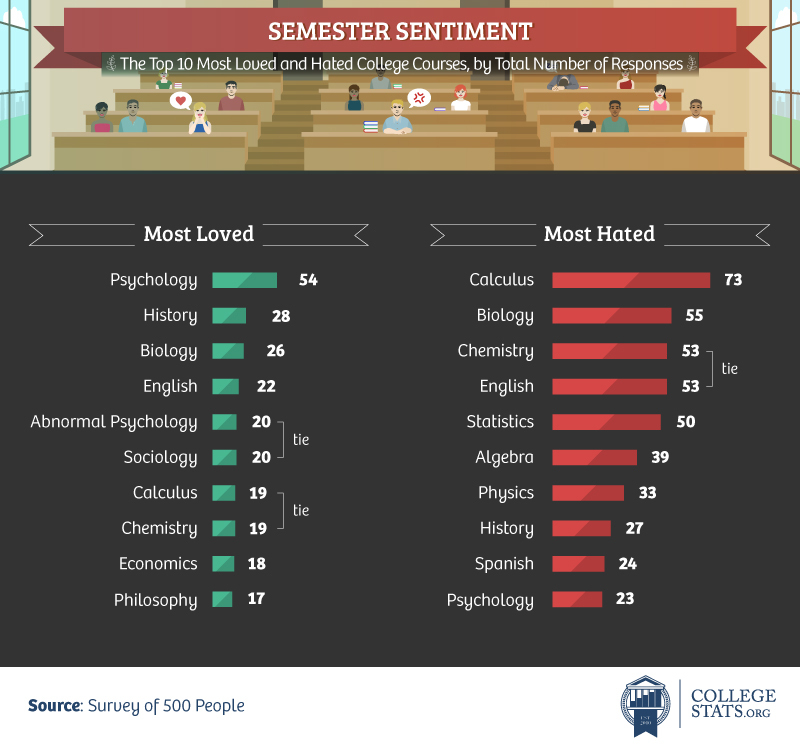 Psychology was the most loved college class for 54 people polled, followed by history. Like the philosopher George Santayana (basically) said, history is bound to repeat itself, and if you don’t learn it correctly, you may find yourself making mistakes that have already played out in the past. From the history of the world to the history of the U.S., students surveyed said this class peaked their interests more than just about anything else. For both left and right brain enthusiasts, biology and English courses were also the most loved college classes. Not everyone was overly fond of math or science, though. Calculus earned the top spot for the most hated college class for 73 respondents. Thankfully, not every major requires this elevated mathematics course. However, if you’re considering a major in biology, chemistry, physics, or engineering, be prepared to find calculus on your schedule. Of course, you might land among the 19 people who loved taking calculus in college. 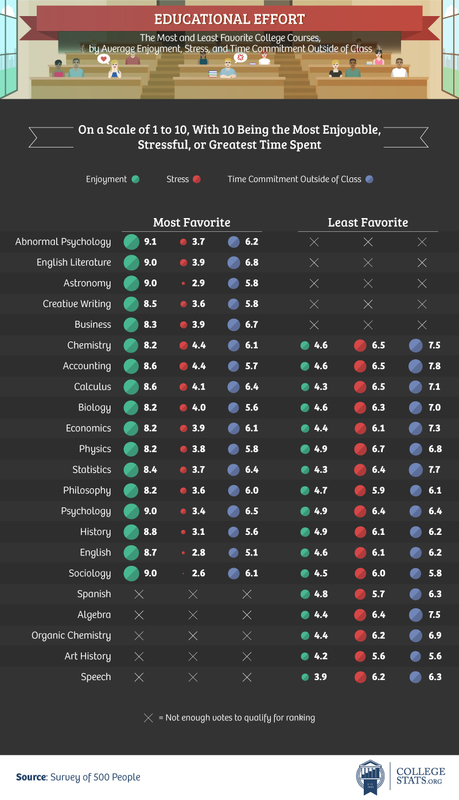 While many former and current students loved psychology, the study of the mind and human behavior was also the 11th least favorite college course. Just because a class is well-reviewed or enjoyed by others doesn’t necessarily mean it’s going to be your cup of tea. Similarly, history was the second most favorite class, but the ninth least favorite subject. Students were perhaps the most split over biology. While it was the third most favorite course of students polled, it was the second least favorite subject they hoped never to take again. 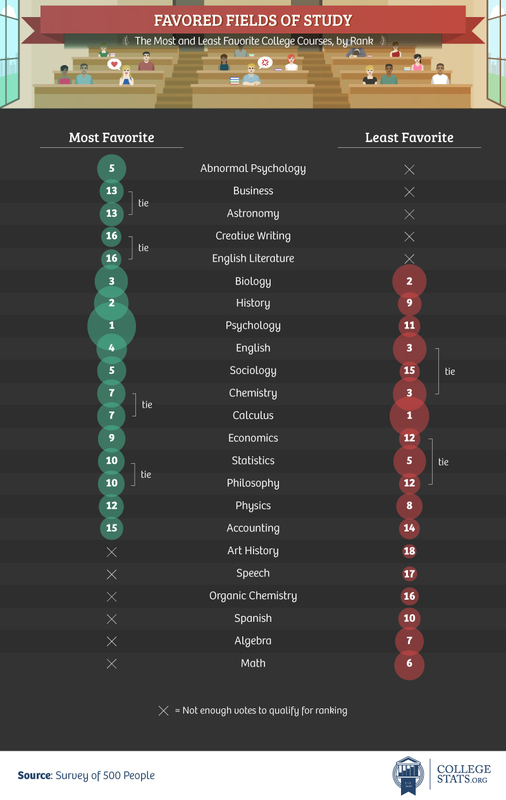 However, astronomy, creative writing, abnormal psychology, business, and English literature weren’t the least favorite of any participants. Classes that were the most enjoyable by those surveyed were also some of the least stressful and were generally less time-consuming. Abnormal psychology – which studies unusual or abnormal behavior patterns in people – was the only course rated higher than a nine out of 10 for average enjoyability. Current and past students also rated the stress of abnormal psychology a 3.7, on average, and rated the time they spent working on the class roughly six out of 10. English literature and astronomy also earned a nine out of 10 for enjoyment, though astronomy was rated as being less stressful and taking less time each week, on average, to study and prepare. Sociology and English classes were rated the least stressful, and students spent the least time outside of class for their English and history assignments. Speech classes, overall, were rated the least enjoyable, earning less than a four out of 10 for enjoyment and over a six for stress, on average. People who told us physics was one of their least favorite classes said it was among the most stressful, rating it almost a seven. One of the biggest advantages of college is that you finally get some say over the times your classes are held. If you consider yourself more productive in the morning (which isn’t necessarily better, according to science), then you might elect to take earlier classes. Night owls, on the other hand, may not want to wake up at 7 a.m. to trudge across campus and sit in a lecture hall while half asleep. More people who were most productive in the evenings enjoyed psychology and history classes than those who were productive in the morning. Early risers who were more productive in the mornings were more likely to prefer accounting than those who liked to work late. Night owls were also more likely to say math courses like calculus and algebra were less enjoyable compared to people who felt more productive in the morning. 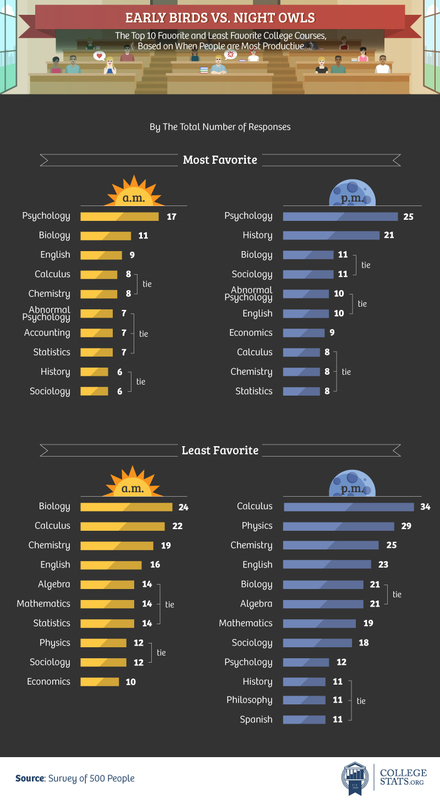 Yes, mathematics is the least popular field of study for those surveyed. But while the broader bucket of arithmetic may be vilified, calculus and statistics were some of the most beloved courses behind psychology. Factors such as being a morning or night person also changed whether a course, such as history, was seen in a positive or negative light. For more information about the best colleges for the best value, visit CollegeStats.org. Discovering your dream school has never been easier. For this project, we surveyed 500 Americans who are currently enrolled or have graduated college. Participants were prompted to type in three of their favorite college courses and three of their least favorite college courses. They were also prompted to answer a number of questions about their enjoyment, stress, and time spent on each course outside of class hours as well as their personal college experience. Want to share this information about college courses with your readers or fellow students? We invite you to do so for noncommercial purposes only. We only ask you to please provide a link back to this page so they can learn more about college courses and this project.